Chilean fire tree blooming in the Chile Entry Garden at Pacific Connections in early May. 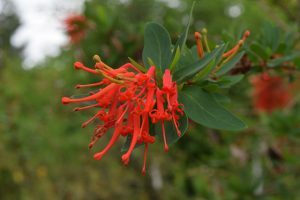 Arboretum Director Emeritus Dr. John Wott has made it a personal mission to expand our collection of Chilean fire trees (Embothrium coccineum). In the latest issue of the Arboretum Bulletin, John profiles this fabulous spring-blooming, evergreen plant and details the history of the specimens growing in Washington Park Arboretum, the city of Seattle, and beyond.